SAM BOWEN HAS made relatively light work of the opponents who have been put in front of him so far in his unbeaten professional career, which is probably why it has been hard work finding many willing takers to go in with him. The rise of the supremely talented super featherweight has been blighted by potential opponents rejecting the invitation to challenge him since he was mandated for his first eliminator and title opportunity. Even though his character borders on reserved, Sam’s reputation as a fearsome operator in the ring has gone before him and he ended up being propelled straight into British title contention, which he won impressively in April of last year. I was certainly impressed with what I saw in his first fight for us in October when he broke down and ultimately dismantled the tough Argentinean Horacio Cabral, finishing him off with a devilish body shot in the fourth round. Unfortunately a sparring injury kept him out of action in December, so I am now particularly looking forward to Sam making a first defence of his British title at the Morningside Arena in Leicester on Saturday. Even this time around Sam has had to contend with a change of opponent after injury forced the withdrawal of Ronnie Clark, but another Scot, Jordan McCorry, has stepped in to fill the void and – as I am told I often say – he will not just be coming to make up the numbers with a British title belt at stake for the winner. 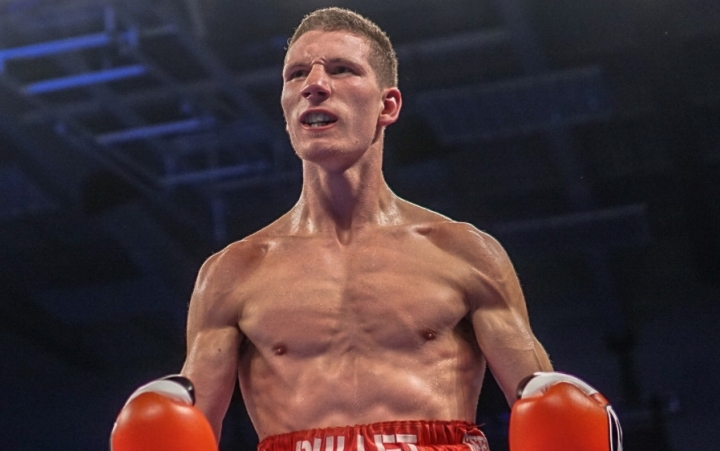 We are in a good position where the British super featherweight scene is concerned, with obviously Sam – as British champion and WBO Intercontinental belt holder – leading the way and the likes of Zelfa Barrett, Archie Sharp and Lyon Woodstock all wanting a piece of the action. It reminds me in some ways of the time years ago when Naz, Steve Robinson and Paul Hodkinson were all in the picture, with Steve winning the world title and defending against Paul, Colin McMillan and Duke McKenzie before Naz took over at the start of his reign as world champion. The battles of the Brits can happen again and these are the fights that appeal to the public, although I do feel that Sam is at the stage where he needs to be pushed on quicker because I firmly believe he is good enough and we have a genuine talent on our hands. I think he is one of those fighters who will raise his game the better the opponent you put him in with, so we don’t want to hold him back in any way and the others will have to earn their stripes in order to fight him, which I am sure they will and give us all big domestic fights to look forward to. The Morningside Arena, home of the Leicester Riders basketball team, is a great little venue with tremendous views from every vantage point and it is the ideal place for us to develop our talent from the region. Hopefully, in the not too distant future when the likes of Sam are in big title fights, we can move them to a bigger stage and really build something special in the East Midlands where plenty of top young prospects are beginning to make a name for themselves. Two of which are the Leicester pair of CJ Challenger and Kyle Haywood, who will do battle on Saturday for the vacant Midlands Area super welterweight title. These Area title fights rarely disappoint, especially if fought for by two young, unbeaten fighters like we have in this one. Local pride and bragging rights are at stake and I am anticipating quite a confrontation in front of two passionate sets of supporters from the same city.